Well, by the end of this past weekend I finally had unpacked and organized all of my remaining kitchen items. (A few things had to be returned to their owners or donated.) I made out a meal plan for the week, for what seemed like the first time in ages, and headed to the store. I’ve been favoring AFR lately in an attempt to make my cooking life a little simpler and leaner. And I even managed to make a couple of dishes from it in the midst of being half unpacked the last few weeks. This ended up being 3 courses of mixed latin fusion inspired goodness. The Kale salad was of my own invention to use up some ripe mango and avocado I got from my mother. I used kale because I’m addicted to it and crave it all the time, but I snuck in a little chiffonade of basil since I had just bought it and it smelled so good. It made for a very nice, fresh contrast. I added black beans and some super fresh corn to give it a sort of mexi vibe, and dressed it very lightly with lime juice, a tiny mist of olive oil, a pinch of salt, and some fresh ground smoked black pepper. I was going to try Isa’s suggested Mashed Yuca with Cilantro & Lime, but both stores I went to were curiously out of cilantro. 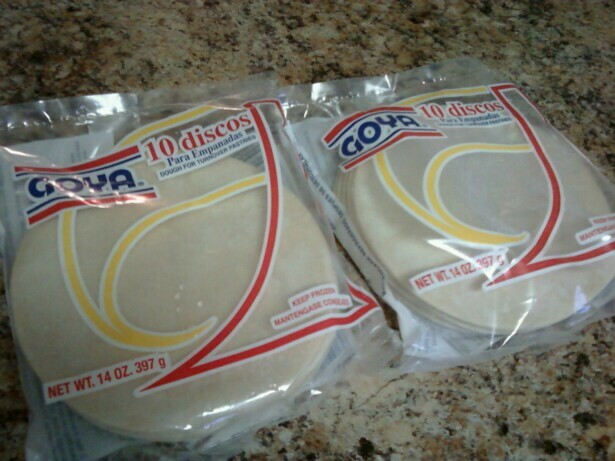 I was already planning on buying the Goya frozen yuca instead of buying fresh, since that’s all I’ve ever seen my family use, and it was easier. That’s what’s in that pot there below on the right, 2 small bags worth. I had a little red onion left from the salad, so that’s the pink you’ll surely notice in my final result. I used this and 2 big cloves of garlic to make a quickie mojo, because I just can’t imagine eating yuca without it. So I’ll put my little version here as well. It sure tasted good. But honestly, just the yuca straight out of the salted water tasted amazing. I love yuca. I had never made it before. I did use Isa’s suggestion for reserving a cup of the cooking water to mash with. So I made a double batch of the tofu, because Thomas is a tofu eating machine, and I wanted some leftovers to eat with the leftover salad for lunch the next day. 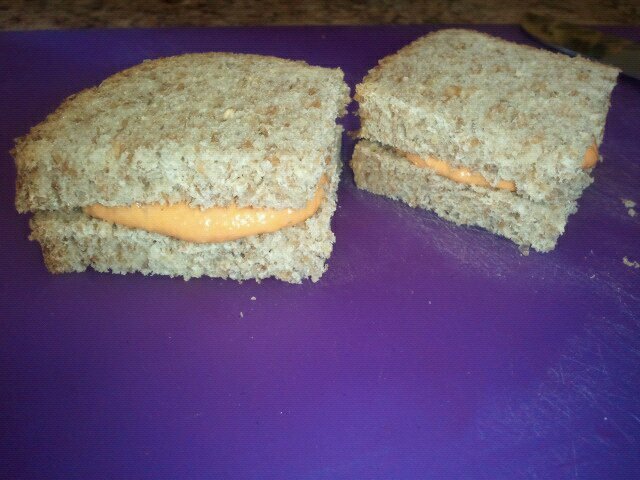 (PS- I did, and they were extremely delicious together!) So that’s me putting fork holes in two bricks of sprouted, prepressed tofu. The only thing I didn’t double in the marinade was the oil. I stuck with just the 1 tsp. 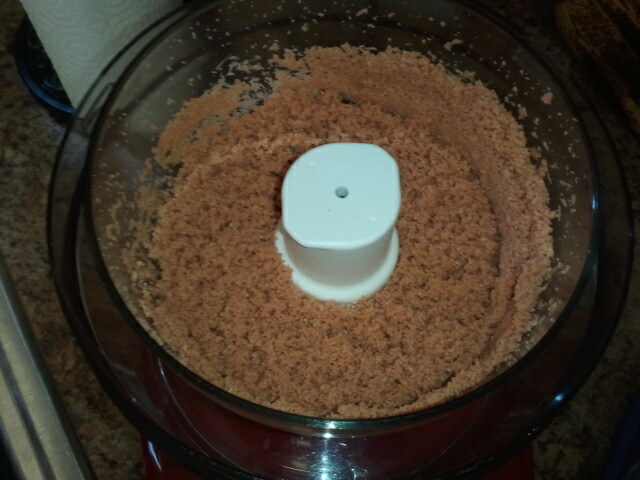 and I used less salt in the rub, and not quite double the chili powder. 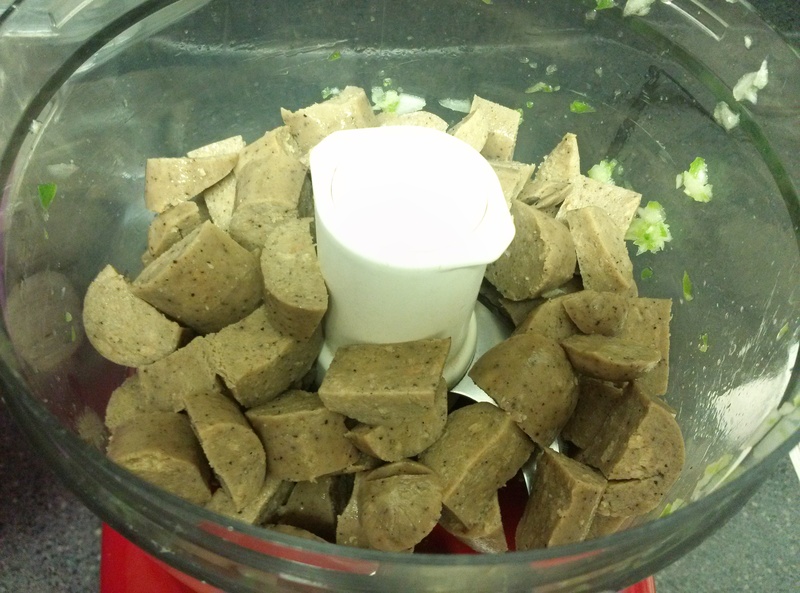 2 lbs of frozen yuca chunks (I used the Goya Brand), cooked according to package directions/taste. I like mine a bit “al dente” for lack of a better term. Yuca will get mushy, but for me the perfect texture is still firm on the inside. 1. In the last 5-10 minutes of yuca cooking, spray a small skillet with a little olive oil and lightly fry up onion and garlic. As it gets dryer, splash in 1 tbsp. of lime juice, and cook down. 2. 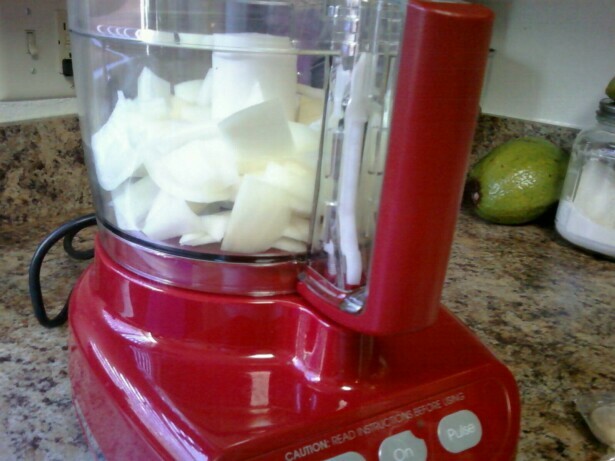 Drain yuca and return to pot or to a large bowl you can mash it in. 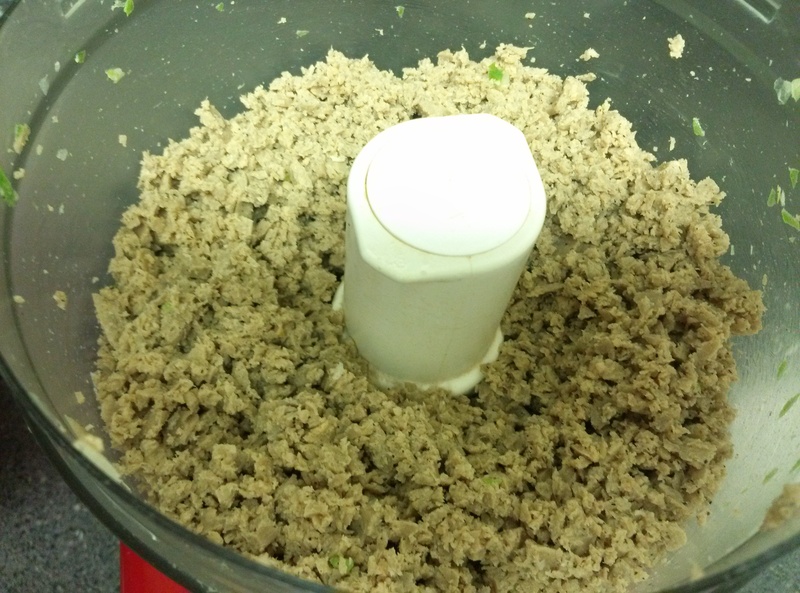 Remove the fibrous little strings in the centers of the chunks, preferably with a fork so you don’t burn your fingers. Add “mojo” mixture, additional lime juice and enough cooking water to get to your desired consistency. Mmm! 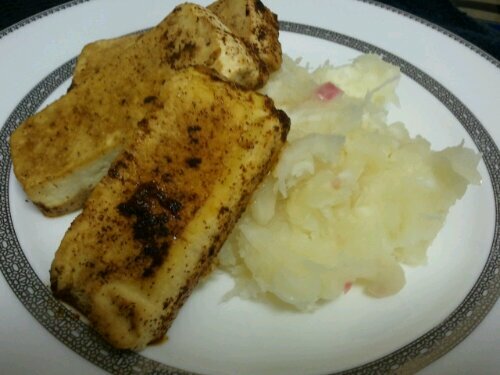 This made a wonderful bed for the tofu. You know who makes the BEST cuban food? My Honduran dad! 😉 We went over there Sunday evening for dinner and my dad made my favorite, black beans and yuca with mojo (fried onions in a citrusy olive oil & garlic sauce)! Mmm! My mom was about to cook up some Gardein Beefless Tips in a skillet when I stopped her and showed her my easy toaster oven method. Just throw those in a small baking pan and cook on 425*F. 10 minutes for 1 package, or 20 minutes for 2, stirring once halfway. I don’t know about you, but I find it way easier to pop something in an oven and set a timer. Plus then you can leave them on warm while you finish cooking the other things. These made a nice vegan substitute for the ropa vieja he would have normally have served before he watched Forks Over Knives! I ordered sides of black beans*, boniato frito (fried sweet potato, the white kind), and yuca con mojo (boiled yuca with onions and olive oil with citrus). The boniato was really nice, it didn’t taste deep fried at all, more like oven fried. My pescetarian mom ordered arroz con moros to share with my dad (which had meat that she picked out), black beans, tostones (fried, flattened, salted plantains) and platanos frito (fried, sweet plantains). So yah, a lot of fried food, but still yummy cuban veg food out with the family. We did not hit the bakery. That definitely would have been torture! Which reminds me, the holidays will be here before I know it, and I still need to perfect some cuban pastries by christmas! *Please ask about the black beans if you want to be sure they are vegan. I didn’t, because black beans usually are. So, I’m a half Cuban, half Honduran vegan. Why should you care? 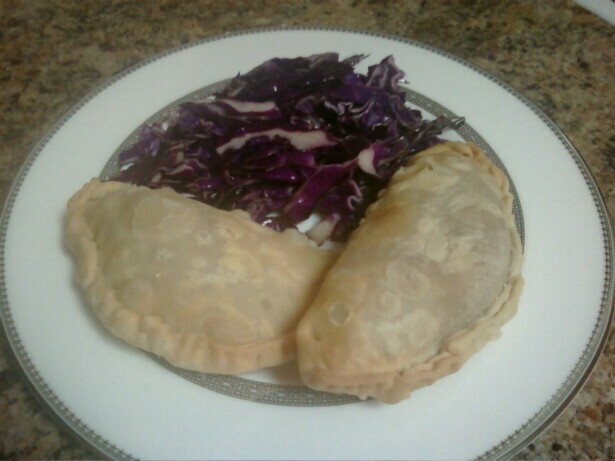 Well, because as a cuban raised in South Florida, I can tell you confidently that I know a thing or two about empanadas, and these are like [vegan] heaven deep fried in dough. Coincidentally, I’ve been making these for years. Way before I was vegan. When I was still eating meat even! (Only I was making them with Boca Burger crumbles then.) It never occurred to me that they were vegan until after I made the transition and checked out all my ingredients. $$$ If you don’t wanna deal with rehydrating the TVP, you can use vegan burger crumbles instead, but just a warning, TVP is 3 billion times cheaper! 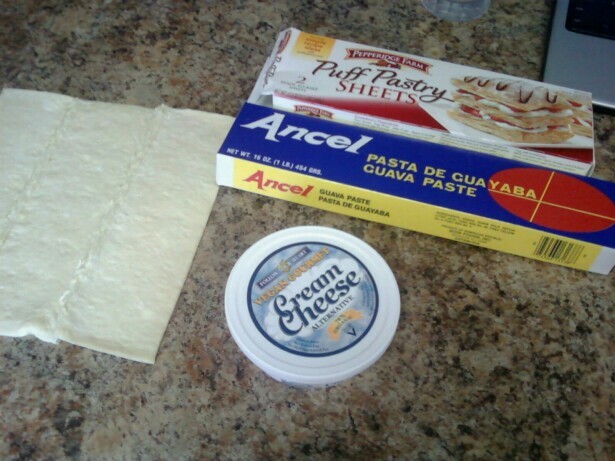 For example, the TVP necessary for this recipe cost just over $1. Equivalent amount of vegan crumbles would have cost $9-10! You can use veggie broth in place of the water and bouillon cubes too, if you have it on hand. But again, the bouillon cubes are another great way to stretch your dollar. 1. 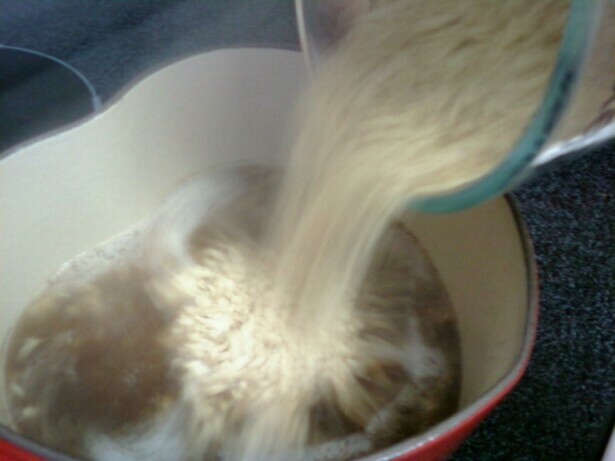 To rehydrate TVP, bring stock, liquid smoke and worcestershire up to a boil in a small saucepan. 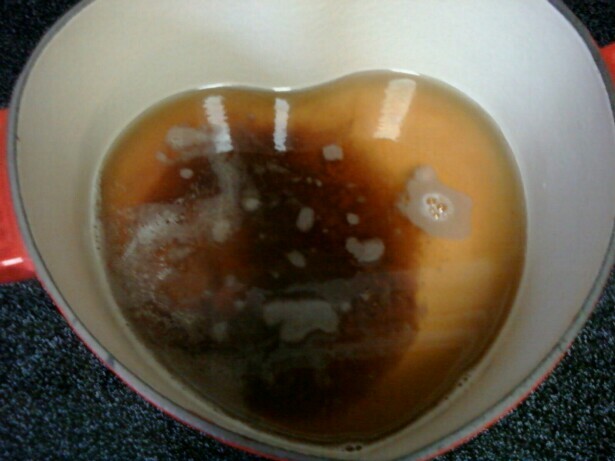 Remove from heat and stir in TVP. Cover and set aside. 2. In a large skillet, cook onions on medium heat until translucent, about five minutes. Add garlic and cook an additional minute. Add TVP and all other ingredients. 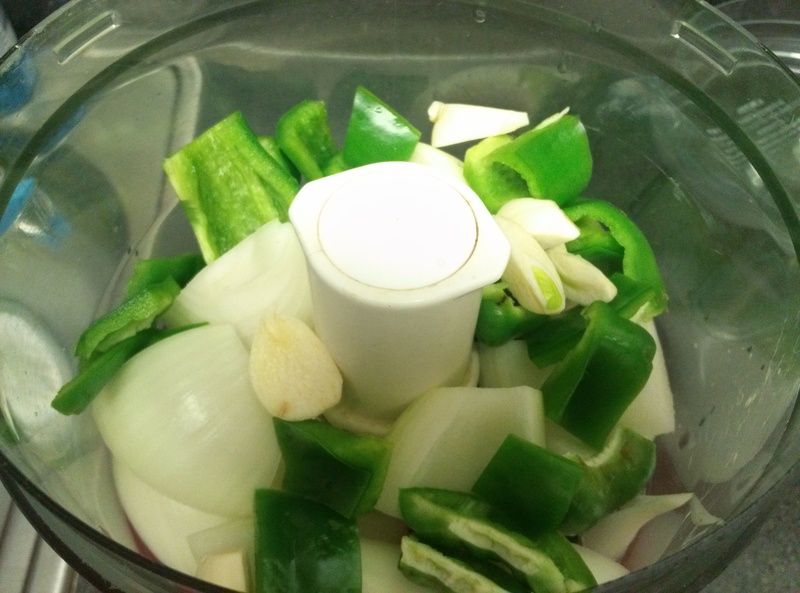 Simmer over low heat for 25 minutes to let flavors combine. 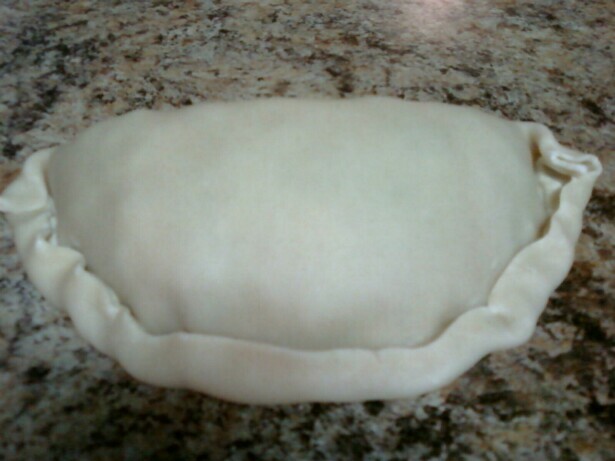 Let it cool if using for empanada filling. 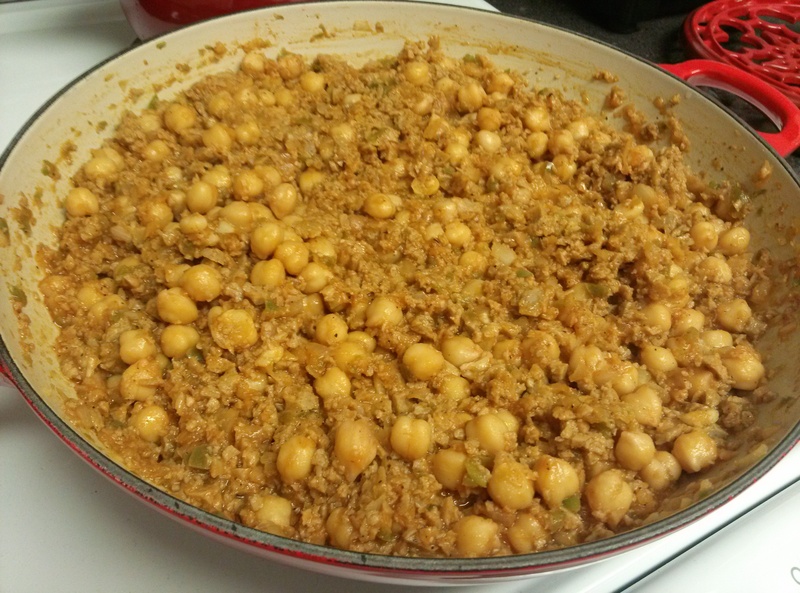 If using as picadillo, serve with some hot brown rice and skip step 3. 3. Roll out empanada dough circles lightly with rolling pin, and place about a 1/4 cup of filling in half of the circle and fold to close. Use a fork to crimp the edges closed and deep fry until golden brown. Drain on paper bags or paper towels. These are great served with vegan sour cream for dipping! Prepare your broth to hydrate the TVP. I totally didn’t feel like chopping that much onion. A few quick pulses minced them. 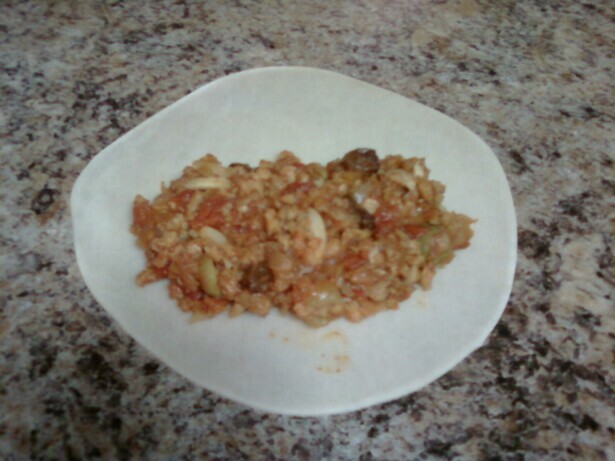 Subsequently, I minced the garlic in there too while the onions cooked. This left me time to slice up my olives and have the rest of my ingredients ready to go. Simmer and cool. That’s a lot of filling! About a 1/4 cup in each should do it. Fold in half and press closed. 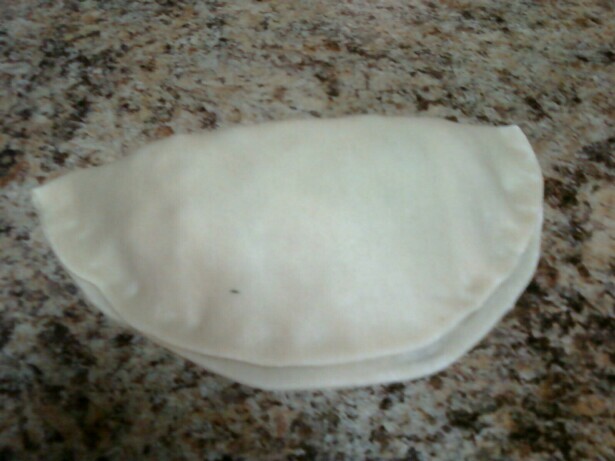 I like to fold the edges over to make sure it stays closed. 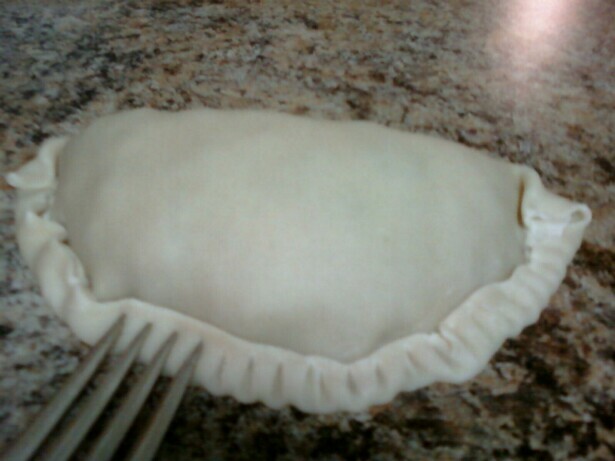 And then crimp the edges with a fork to seal it tight. 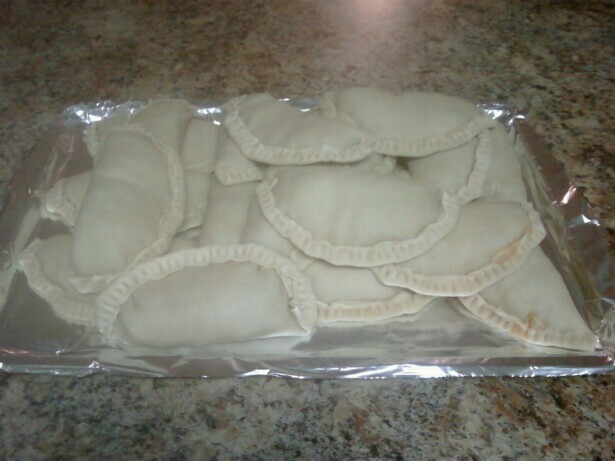 20 empanadas, ready for frying. 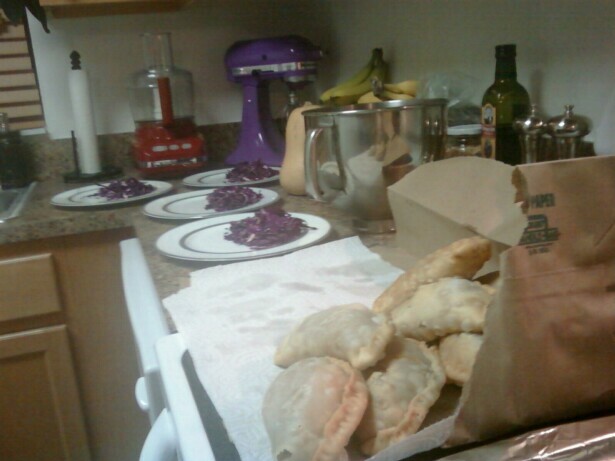 Drained empanadas and waiting on the last couple batches to plate. Okay, so I did end up trying out the Viva Vegan! 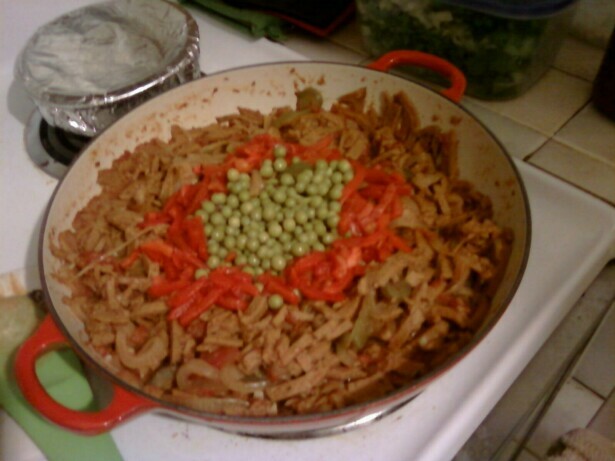 seitan as the base for this ropa vieja dish. 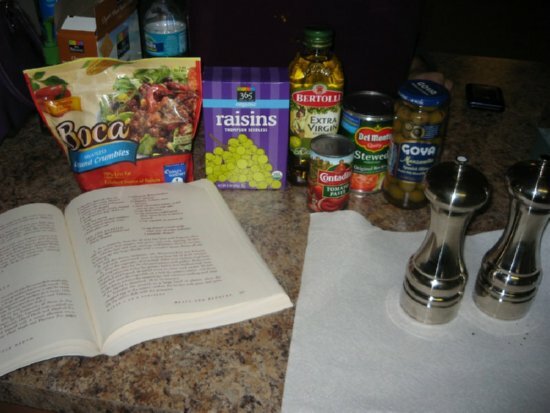 I didn’t use her version, but instead adapted a recipe from one of my cuban cookbooks. 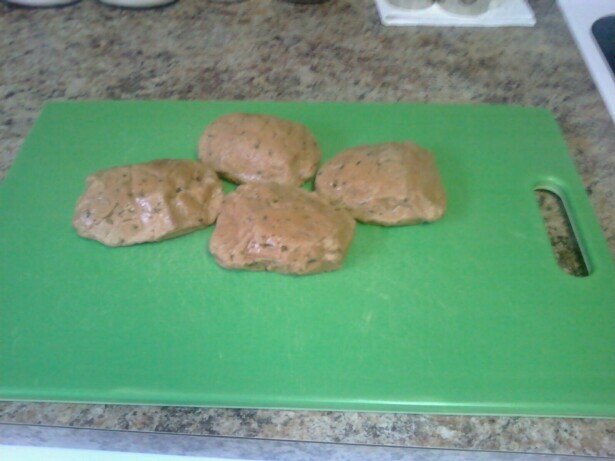 I’m not the biggest fan of chewy seitan, so I kept my seitan loaves refrigerated for a week before using them for extra firmness. 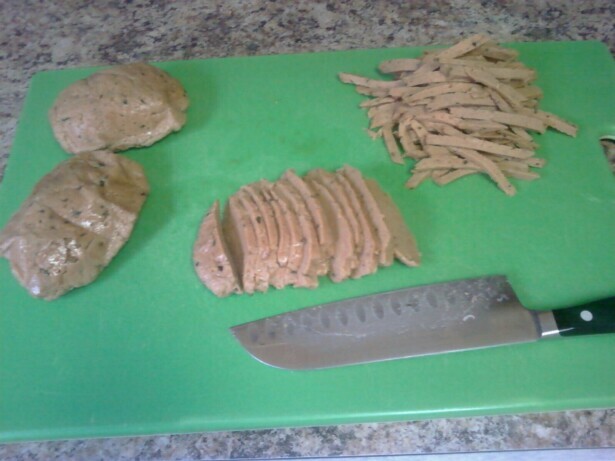 The key to cutting the seitan is to try to get it as close to the texture of shredded beef as possible. So slicing and slivering it very thin (the thinner the better) and somewhat irregularly as possible. My pieces were probably still too big after all that work, so shredding it may be the best option. (Plus, it will probably absorb the flavors better and faster that way!) I used all 4 loaves from the Viva Vegan!’s red seitan recipe to make this dish, and it was a lot. Definitely 6-8 servings. So keep that in mind in case you want to halve it. I served this with brown rice. 1. Heat oil over low heat and add onions, peppers and garlic. Cook for about 8 minutes, stirring often. Raise heat to low-medium and add tomatoes, sauce, sherry liquid smoke, worcestershire, bay leaves, and salt & pepper. Simmer for 15 minutes. 2. Add seitan and simmer, covered, for an additional 30 minutes. 3. Remove bay leaves and add pimentos and peas as garnish. For better flavor, you can make this the day before (up to step 2) and then simmer it over low heat for 30 minutes until it’s heated through, and then proceed with step 3. 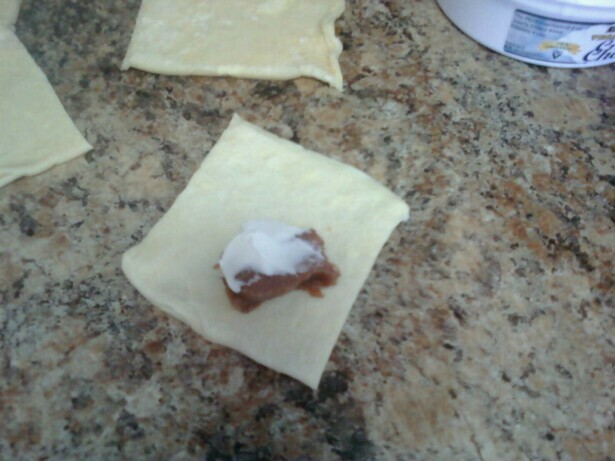 These take a cheat from frozen Pepperidge Farm Puff Pastry sheets. Just lay them out to thaw for 40 minutes, and you’re ready to go! 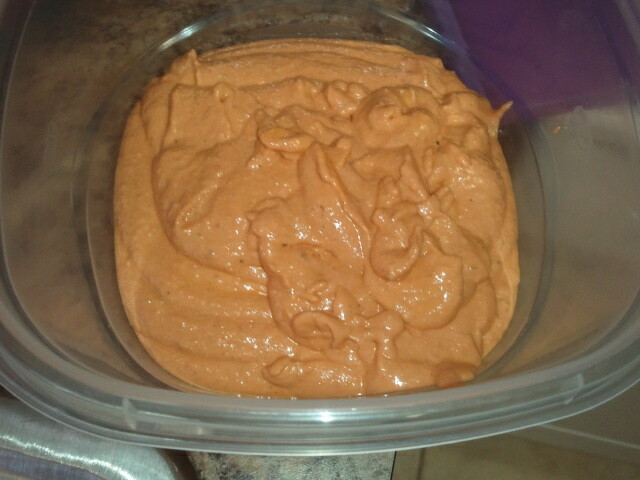 Here I made 2 variations, Guayaba y Guayaba con queso crema (guava & guava with cream cheese). 1. 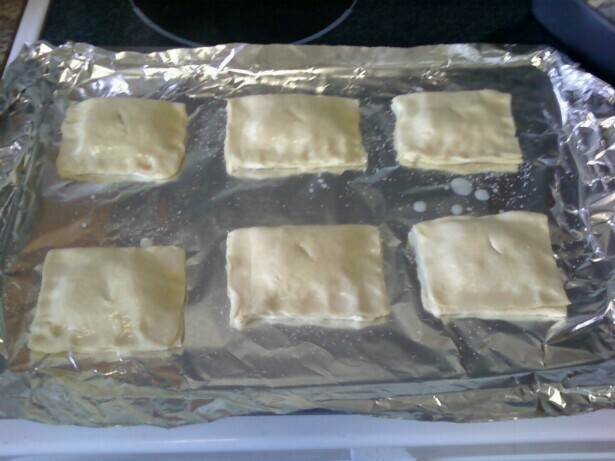 Set puff pastry sheets out to thaw for 40 minutes. Pre-heat oven to 400*. 2. Cut pastry into desired shapes. 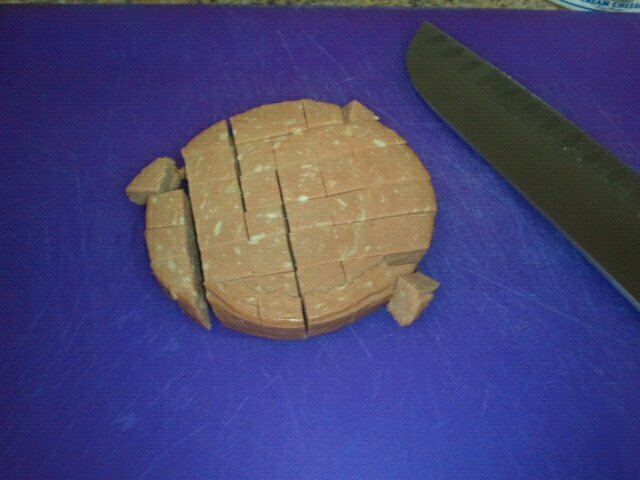 Add thin slice of guava to center of one half, leaving enough room around the edges to seal. For cream cheese variation, just place a dab of cream cheese on top of the guava. 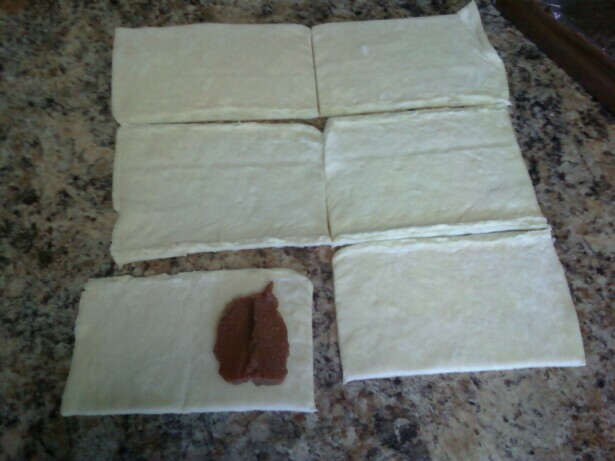 Fold over and press sides to seal; use water if it won’t stick. Insert tip of knife to make vent hole in top. 3. Use a pastry brush to top with wash mixture, taking care not to let it run down the sides, as this will glue them down to the pan. Sprinkle with sugar, if using. 4. Place onto lightly greased baking sheet, or one prepared with parchment or foil, and bake at 400* for 12-15 minutes. They will be golden on top, puffed up and flaky. Enjoy! my first meal in my new kitchen! oh, by the way, i have to tell you… if you do not have at least one nice all-purpose knife (i use a wustof classic santoku, and i use it for everything. ) you really need to get one! 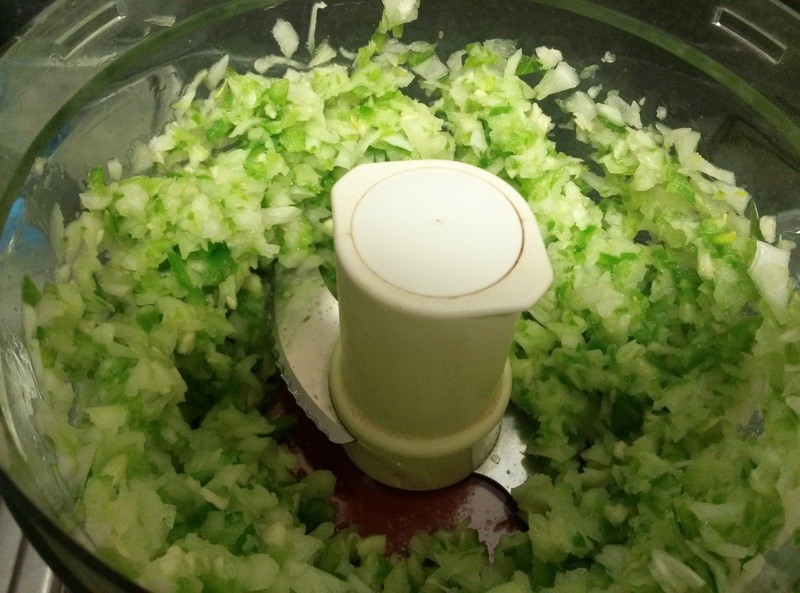 chopping onions and peppers with the chef knife from my $15 chefmate block set was awful. i can see why people hate to cook. even if you cook occasionally, it’s worth it; a sharp knife makes chopping a pleasure. 1. Pre-heat oven to 350*. 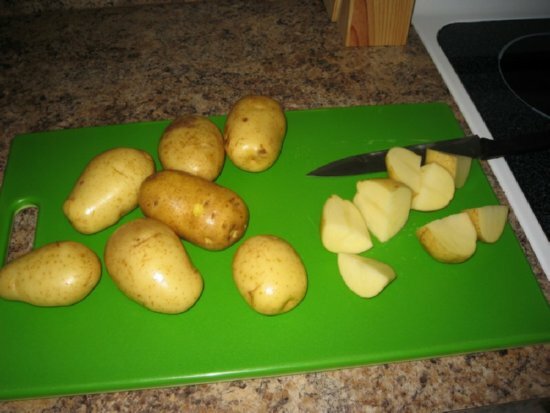 Place potatoes in large pot and cover with cold, salted water. Bring up to a boil and cook for 15 minutes, or until potatoes are tender. When you are ready to mash them drain well, and return to pot. 2. After starting potatoes, heat olive oil to medium in large skillet. 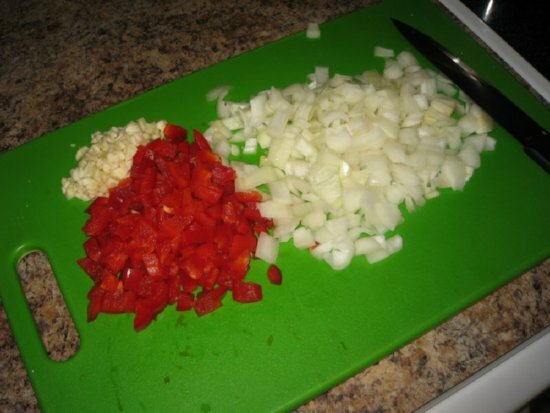 Add onion, bell pepper and garlic, and cook for 7 minutes, stirring often. Add beef substitute, and stir frequently until cooked through, about 7 minutes, or according to package instructions. 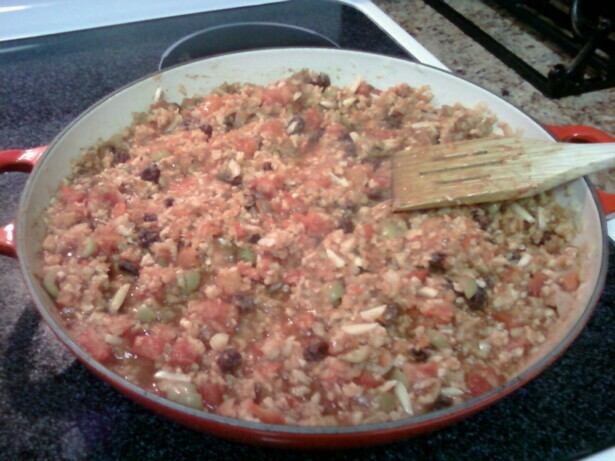 Add sherry, worcestershire, hot sauce, tomatoes, tomato paste and salt to pan and simmer for 15 minutes. 3. 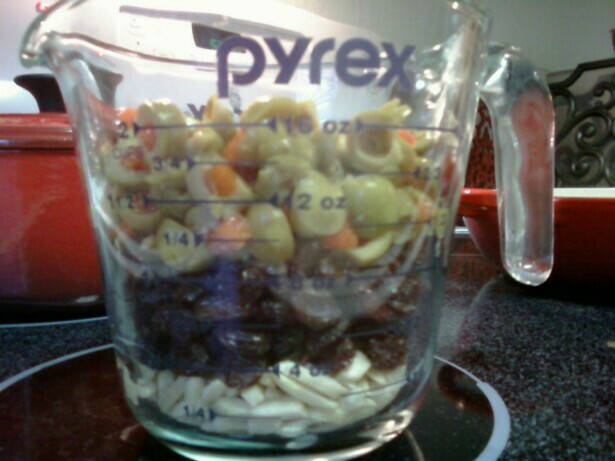 Add olives and raisins and simmer for another 10-15 minutes, or until the liquid is mostly absorbed. 4. While picadillo is simmering you can mash your potatoes. 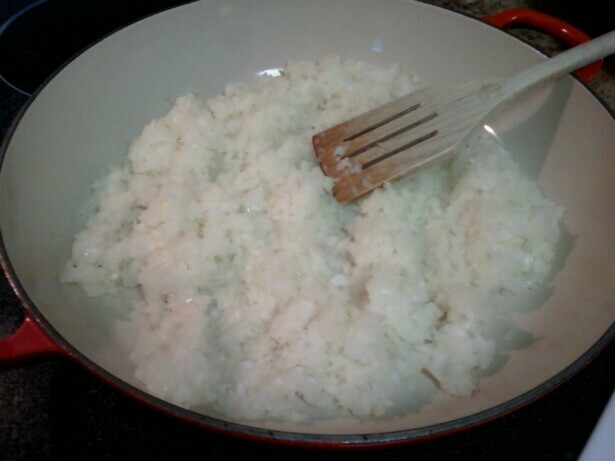 Add milk, butter, salt and pepper and mash with fork or mixer only until smooth. do not over mix! 5. 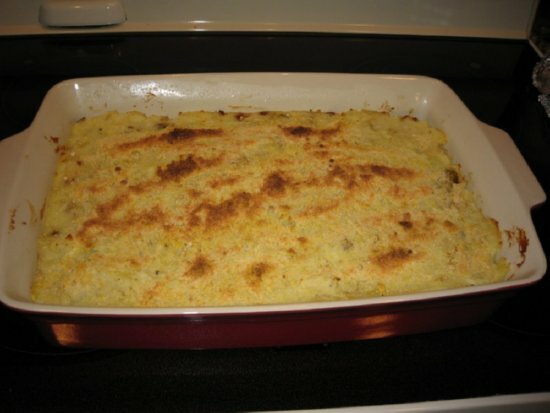 Spoon half of mashed potatoes into the bottom of greased casserole dish. 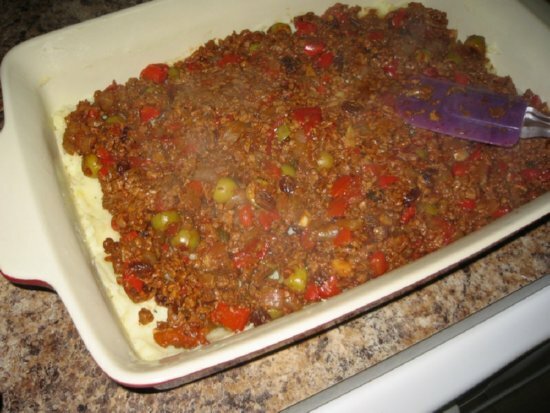 follow with all of the picadillo as one layer, and top with remaining mashed potatoes. 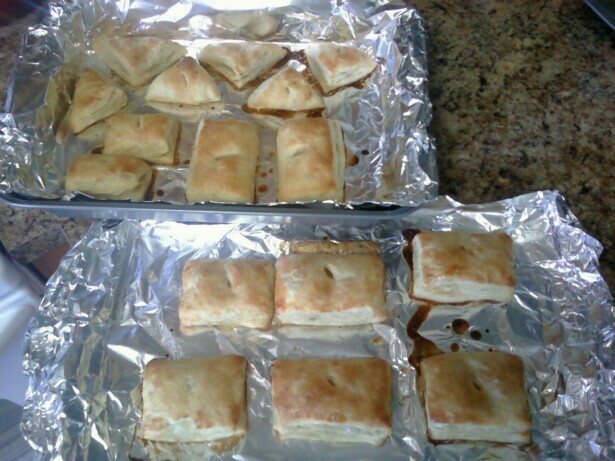 Cover with aluminum foil and bake for 20 minutes. Uncover and top with vegan parm & nutritional yeast, and place under the broiler until the top is golden brown, about 5 minutes. 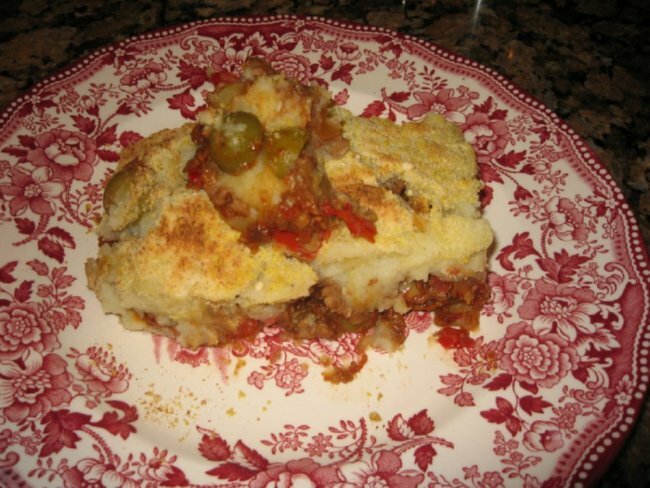 Preparation variation: you can prepare the picadillo the day before, if you wish. you will need to bring it to room temperature as the potatoes cook and then bake for 30 minutes, covered before topping and placing under broiler.